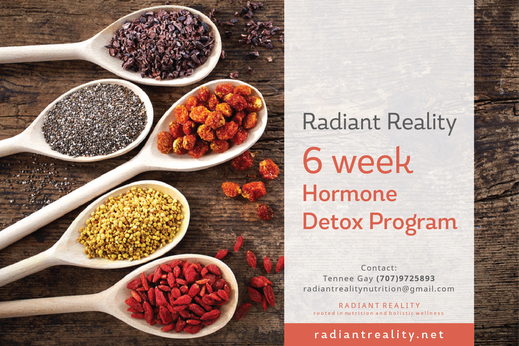 Radiant Reality 6 Week Hormone Detox Program - Radiant Reality | Nutrition. Healing Arts. Inspired Living. As we move into the inward reflective space that winter brings, our bodies transition and change as well. This time offers up an opportunity to clean out stagnant energies, and support the bodies innate healing potential. Hormone health is especially important at this time as your hormones govern the vitality of your entire body. These are master signaling chemical messengers in the body secreted by various glands and organs including the adrenals, thyroid, pituitary, ovaries, testicles and pancreas. Your endocrine system works similar to an orchestra in a multitude of ways to control the level of hormones circulating throughout the body. If one or more is “out of tune” it can throw off the entire symphony of hormones. This program is not a cleanse, but a custom tailored program that provides focused support to reestablish balance to your hormonal system as a whole. In this 6 week program we will work with your specific hormone profile to reestablish balance through diet, lifestyle modifications, herbs and supplements. This program is designed to help both strengthen your detoxification system in order to move out the old, while working to reestablish optimal hormonal balance. This program includes initial consult, five office or phone check ins, personalized recommendations and follow up consult. The goal of my practice is to provide information that will both support you to take charge of your health, and to make changes that will empower you in living a healthier and more vibrant life.